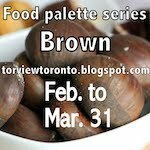 Final day of the blogging marathon !!!! Whew, seriously it's been a hectic week as I had no drafts in my finished work that matches with the marathon. But I've had my fun making all these awesome recipes and had a virtual blast from my marathon buddies who also did an outstanding performance. I did badham halwa to conclude this marathon as almonds are my fav.. Again a simple recipe from me that hardly requires half an hour to relish this Indian sweet !!! Njoy Guys.. Method : Soak the almonds for 2 hours or boil the almonds for 3 minutes and peel the skin. In a blender /mixie add the blanched almonds,milk and grind it coarsely (like rava ) .The batter should be in running cocnsistency like u grind for dosa. Now add the batter and the salt ,sugar in a non stick karahi and combine well. Continue to cook this mixture in medium flame and add a tbsp of ghee when it starts bubbling. Keep on stirring this mixture else it would get burnt. U may want to turn low the heat a little bit. Stir the mixture again for 3 more minutes and add the saffron strands and combine well. Add the remaining ghee as well. Continue to stir and add the saffron colour as well. Turn off the heat when the mixture starts leaving the sides and the ghee starts coming out. It took me almost 10 minutes on the whole to make this halwa (apart from soaking n grinding) .Garnish with nuts of ur choice and Njoy !!! Check out the 25 bloggers running for the Blogging Marathon! Happy eating and happy blogging guys !!! u always make me crave for your delicious food! 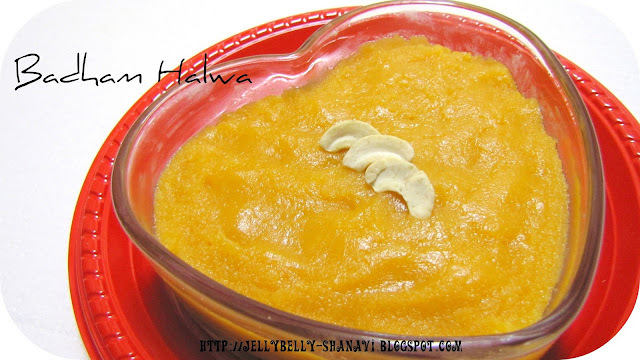 Wow..very colorful and awesome halwa..
Badam halwa looks to be so inviting and fulfilling. Excellent dessert. Awesome recipe. Its easy and looks delicious. What a wonderful way to finish the marathon... the pic looks so good and this is my "favourite diet breaker"...he!he!he..
Soo rich looking and inviting halwa, i can finish the bowl rite now.. The texture is perfect & looks mouthwatering...!!!! yummmmmmmmy can I take the bowl and have a quick spoonful? Delicious looking Halwa beautiful color..
very appetizing halwa! Nice to end a marathon on a sweet note! Shanavi, In response to your comment about babies..Just hang in there! Its just a beginning, be brave to see more! :D I guess babies are made to teach their parents what patience is! But, after all the drama we still adore them..
pass my sweet hugs to your son. This one looks really irresistible. Almond Halva looking awesome and mouth watering.